Is a proposal for a modular gearbox design/construction system. The system uses 3D printed modules (blocs), which can be simply glued together to create a fully functional gearbox. The current prototype has been developed for use with 'O' Gauge (7mm Scale) models. However, a 4mm scale version is currently being looked into. 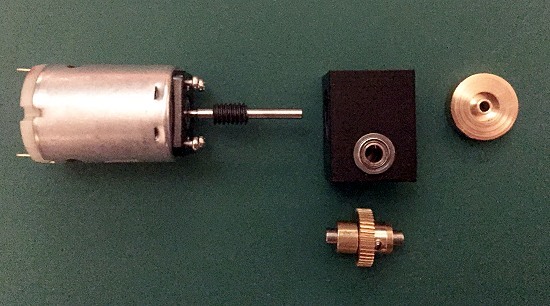 This module consists of a 3D printed case, motor which drives either a single or two start worm and wheel gear set and a fly wheel can be fitted, if this is required, with all shafts running in single row radial ball bearings. The primary drive module can also be used as a standalone unit in it's own right. Or extended and the ratio changed using a combination of the intermediate and/or final drive modules. The motor is fitted to the module using a standard configuration for all motors and a laser cut adaptor plate. 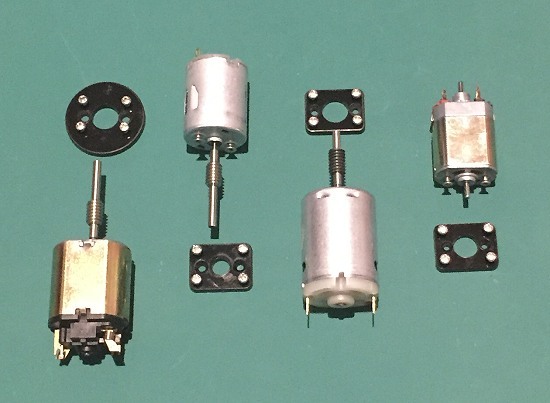 Motors are fitted to the module using a standard four screw configuration for all motors and use a laser cut adaptor plate to make the motor mounting positions suitable for the module. This means that to fit a new motor you only need to make a new adaptor plate. 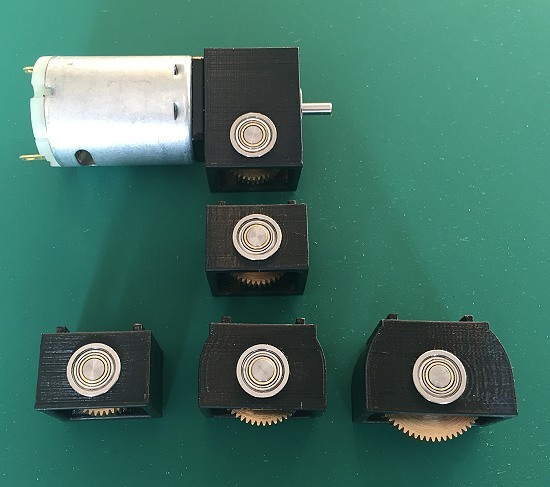 This module consists of a 3D printed case and a single helical gear which would be either left or right handed depending on it's position in the gear train. The gear shaft runs in single row radial ball bearings. The intermediate module is used to extend the position of the final drive axle. 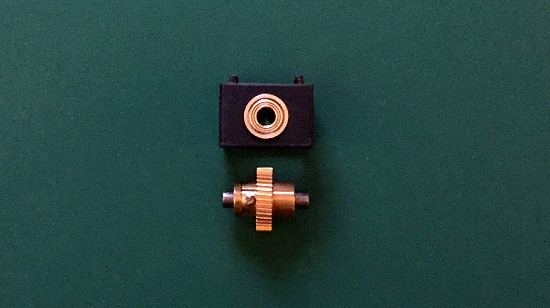 This module consists of a 3D printed case and a single helical gear which would be either left or right handed depending on the gear it will mesh with. The gear shaft runs in single row radial ball bearings. The final drive module is the last module fitted to the gear box and is one of the parts that has a major effect on the overall ratio of the gear train. Using a combination of either single and two start primary drive gears as well as changing the number of teeth in the final drive gear, a number of different ratios can be created. Also, as the gearbox uses helical gears this will reduce the noise generated when the gearbox is in use compared to a spur gear version of the gearbox. It is also planned to develop a mobile app to help with the selection of the modules and the creation of a parts list to make ordering easier. This app will also create a virtual image showing the gearbox as the modules are selected and added to the design. Displayed along with the virtual image will be information like the current ratio and dimensions of the gearbox, as it is created. The app will also have a set of design rules. This will stop things like the selection of two right hand gears and trying to mesh them together. Once the design is complete a parts list will be created, which can then be used to order the correct parts for the gearbox design. I'am also looking at the creation of transfer boxes etc. using the same Gear-Blocs system.